I've always said that Viktor is a Halloween rat. 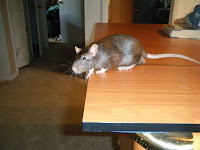 He is brown-gray and likes to skulk around baseboards and look shifty. I even named him for Viktor Von Frankenstein. I never really wanted him, but his brother, Zyklus, needed a friend and when I went back to the store, Viktor was the only rat they had left. They were littermates and so I took him even though I thought Viktor looked plain and boring compared to Zyklus' pretty beige spots, not to mention the crescent moon marking on his forehead. The rats couldn't be more different. Zyklus is sweet, outgoing and loving. Viktor is timid, shy and retiring. Zyklus learned to come to his name while Viktor had to be caught to be put back into their cage. I often regretted not waiting for a friendlier rat to keep Zyklus company and found it hard to warm up to Viktor. The brothers got along great most of the time, but every once in a while Viktor would bite a big hole in Zyklus and I would have to clean him up. Zyklus always took the worst of it, but that doesn't mean he didn't start it. Everything changed the day I came home to find Viktor with a slash across his eye. In the middle of a fight, Zyklus had either bitten or scratched Viktor and permanently destroyed his left eye. This was just before Christmas and I thought we were going to lose Viktor then, but he pulled through and, other than being blind in one eye, I thought he was going to be ok. He was, until a week and a half ago. I think the bad eye got infected and it spread to the right eye. He lost his appetite and his system started to shut down. I started feeding him with a small syringe, giving him a healthy mix of baby food and rice cereal along with water to keep him hydrated. It was working, too. It was touch and go through the weekend, but on Monday he was sitting up and feeling stronger. All week he improved until Friday when he was happily eating his fill of peas, sweet potatoes and bananas with rice cereal. I thought he was safe. I was wrong. This morning he was unconscious and I couldn't wake him up. He's been mostly unconscious all day, not so much refusing food and water as completely unaware it's in his mouth. Tonight he came around for a minute or two, but it didn't last. I sat there, holding this little guy in my hands, and for the first time I could pet his silky coat and admire the glints of red and gold in his fur. He has the sweetest white markings on his chest, and each foot is white... all details I didn't get much chance to explore when he felt better and would squirm and fight to get away. I know that many people think I'm nuts to care so much about a rat, and maybe they're right, but life matters, no matter how small or insignificant. 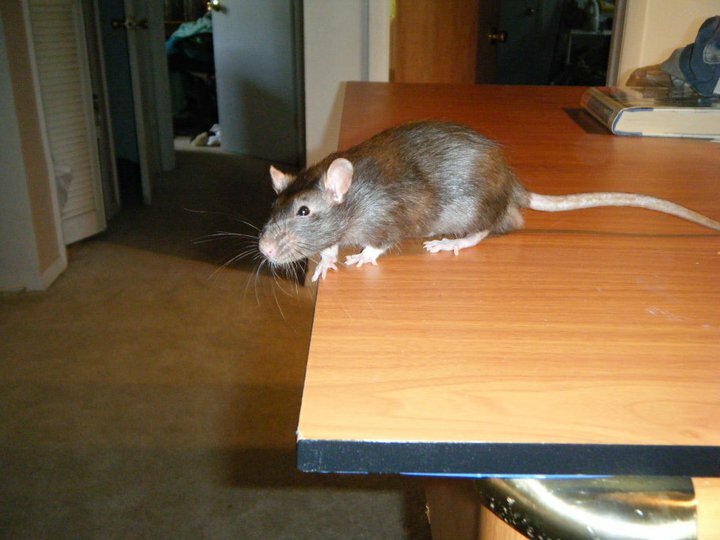 Viktor is just a rat, but he's a strong, feisty little guy who deserves to live. I wish I had spent more time with him when he was well, teaching him to trust me and enjoy my company. I wish he had never been hurt. But, most of all, I wish I could help him. But, the fight is his now, all I can do is wait and worry and wish. Update: Viktor lost the fight sometime last night. I wish it had ended differently.